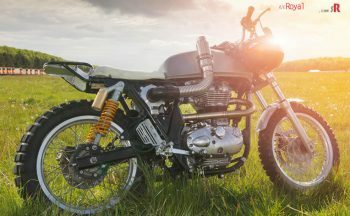 If you are a bike enthusiast and loves almost everything about biking then somewhere must be lured away by the fascination of custom motorcycles already. Such temptation and fascination sometimes gives awesome results and nice looking machines. Today’s custom royal enfield by R&G Custom Bikes is one such impressive example which will leave you awestruck on its first glimpse. 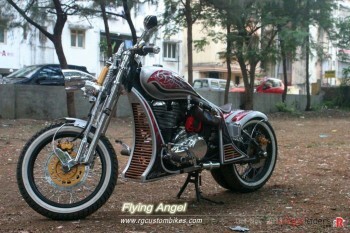 Their recent customization which they created last year is named as Flying Angel and as the name, the bike with its conspicuous style shows a very good stance of creativity in Indian Bike Customization Scene. 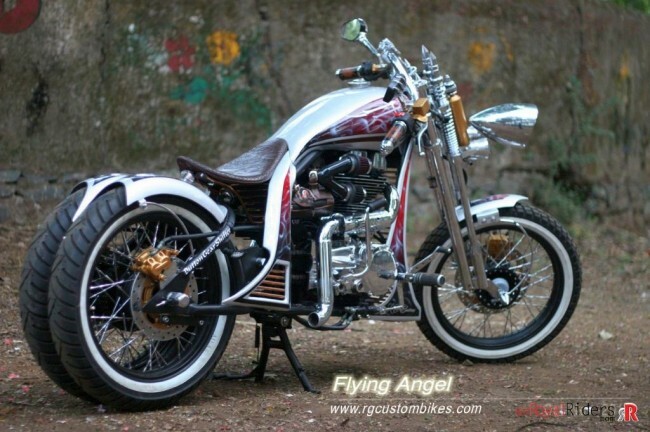 Flying Angel by R&G Customs. 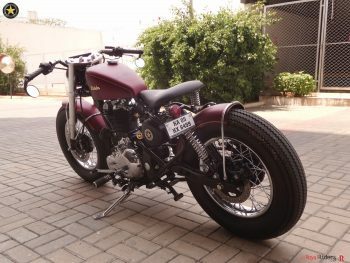 They have been in bike customization from long time, as per Mr. Ganesh, one of the founder of R&G Customs have been modifying and customizing bikes from year 2006 as an hobby and out of his interest but until recently in 2012, they ie. Mr. Ganesh Kotian with Mr. Raju formed a customization firm and named it as R&G Custom Bikes and forayed into professional bike customization. 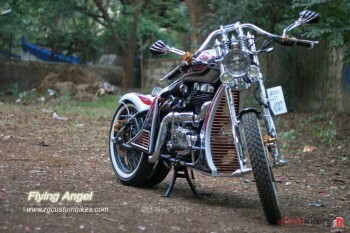 Twin rear wheels is one of the high point of Flying Angel. 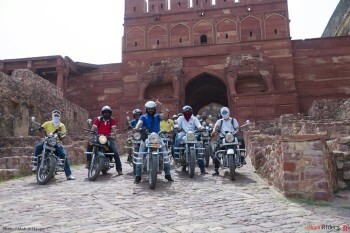 Right from the first glimpse, you can see that bike has been modified by some experienced guys and it is well apparent in it. As you see, the twin rear wheels is one of the strongest point of this bike, you may have seen this concept in foreign bike but I am not able to recall done such professionally in India. As per Mr. Ganesh, the idea of twin rear wheel was a challenging task and it took lots of planning, trials to get it done right. Almost every aspect of bike has been nicely worked upon, you can see the level of attention paid to every minute details of the bike. The front fork is using Girder Suspension which gives it a efficacious presence with lots of chrome and little touch of golden pin at the center. One of the other highlight of bike its automatic gear changer however, I am still not sure how it works but sounds fascinating. The bike is using Mag 18″ wheels converted to spiral twisted spoke in front and again the rear twin wheel setup deploys the same arrangement. To accommodate twin wheels, they have used custom fabricated rear swing arm. That small leather pouch gives a substance to the bike, you can notice it on the right side of bike just by the petrol tank. 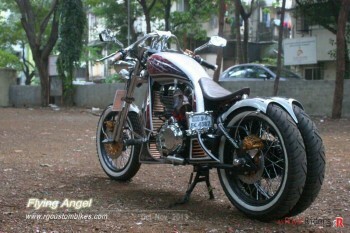 Other than ample usage of chrome, bike deploys a grid of golden rods which not only covers engine, also flows to the rear end of the bike and give its own unique style. 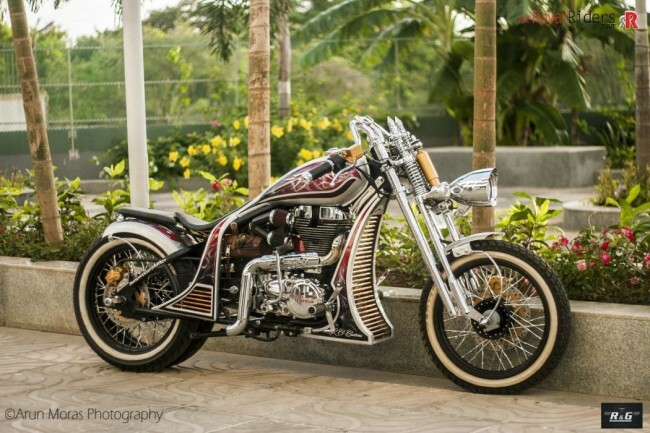 This beautiful work was most appreciated in Rider Mania 2013 and was awarded as most liked bike on the show. 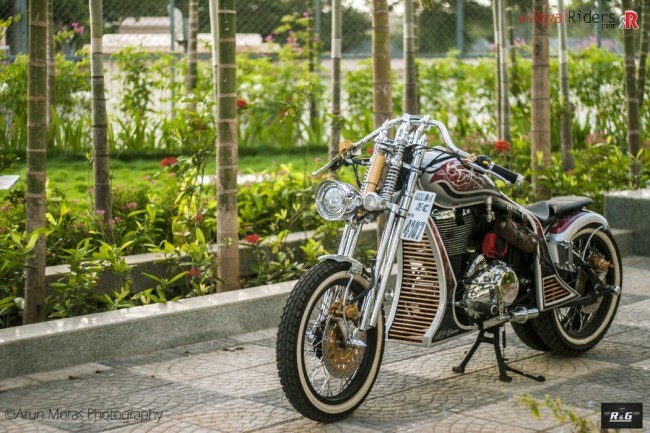 It also grabbed 1st place at IBW (India Bike week 2014). 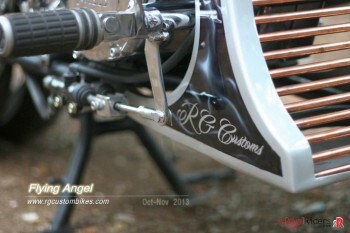 R&G Custom Bike’s Flying Angel. They have plans to come up with more creation in future, currently are working on Royal Enfield based motorcycle with a powerful music system. Other than Royal Enfield, they also take customization works for other bikes like current ongoing project with Yamaha FZ150 as Rising Angel.